Every new parent wants to know how to make baby sleep fast! While you cannot expect newborns to sleep through the night, you can surely begin introducing healthy sleeping habits from the time a baby is three to four months old. “A newborn does not have a fixed cycle of sleep for at least the first two months. The gentle swooshing of the amniotic fluid in a pregnant mother’s womb when she moves about during the day soothes the baby to sleep. 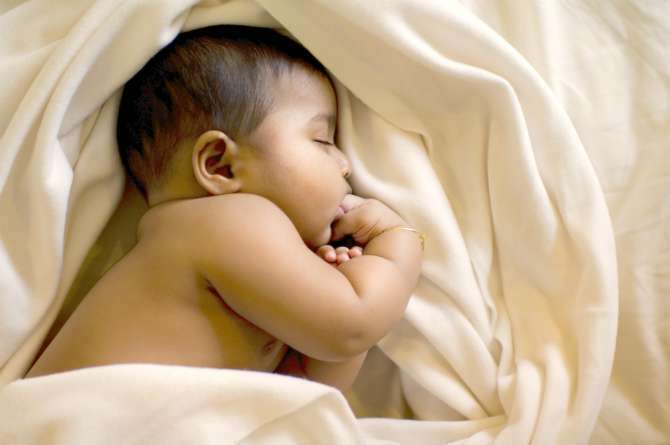 So, for a new baby, it’s about any soothing movement that induces sleep as he does not have a concept of day and night,” says Dr Rahul Varma, paediatrician, Maya Clinic, Delhi NCR. But after your baby is three to four months, maintaining a good sleep hygiene early on conditions the body into a healthy sleep pattern. Here are some tips you could follow to know how to make baby sleep on time and through the night, so that you can claim at least some of your sanity back. The importance of schedules and routines are emphasised repeatedly in whatever we take on and baby sleep is no different. Following a bedtime routine urges the mind to expect sleep and switches it from an alert state to a calm one. “Schedules introduce predictability and a rhythm in the body and hence must be adhered to,” says Amita Jain, psychotherapist, counsellor and founder, Trivium Transforming Minds, Mumbai. When a baby’s sleep pattern is broken, it confuses his body clock and this may lead to irritable behaviour. Stick to the same sleep timings even during the day. A baby then knows what’s coming his way at a certain time. Babies’ brains develop at phenomenal rates and any kind of stimulation turns on their, “what’s this?” button. Now imagine what to expect if they’re exposed to all kinds of stimulation before sleep. “Colour and sound stimulation will just awaken the baby rather than calm him. Sleep must be associated with calmness,” says Jain. 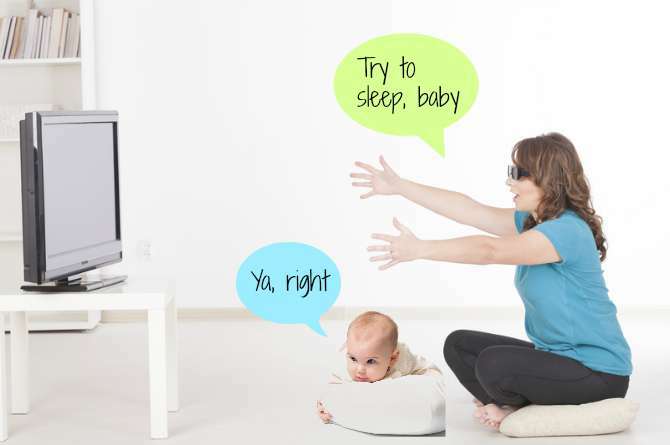 Avoid trying to calm your little one with TV or phone on in the background. This will again, stimulate him and push sleepiness away. You may have enough people telling you that the best way to make a baby sleep through the night is to keep him awake all day. This advice may sound interesting, but take it with a pinch of salt. Babies get overtired easily and require more sleep than adults do. But they need sleep in pockets spread out over the day. “When a body is overtired, it does not come to rest. Fatigue and muscular pain can set in such cases,” informs Jain. If your baby is bouncing off the walls at 11:30 p.m., don’t assume that it’s his ‘active time’. He’s probably had a sleep-unfriendly dinner. Giving the child wrong foods or late dinners make the brain throw sleep on the back burner. Babies thrive on stimulation from playtime and nothing beats a healthy outdoor stimulation. According to a research paper by the Early Head Start Natural Resource Centre, USA, babies who were exposed to plenty of daytime light and play knew how to differentiate between light and darkness better than others. “Outdoor playtime is also positive exhaustion and creates a hormone balance in a child, urging him to sleep peacefully,” says Dr Varma. Most of us may not realise this, but babies are very receptive to the environment around them and pick up emotional cues from parents. So if you’re singing a lullaby to your little one but are stressed out in your head, do not expect your baby to be restful. “A hyperactive mother induces hyperactivity in her baby. A mother needs to destress and calm down before she attempts to put her baby to bed,” cites Jain. Babies associate real quick. The sight of the cradle or a familiar bed is a signal to them to settle down to sleep. But if you’re travelling, the newness may mess your baby’s sleep schedule and this is natural. Even if you follow the above to a T, it may still take a while for your baby to settle down and sleep throughout the night. But don’t lose heart. Avoid fretting if your little one’s sleep schedules vary a bit. Babies take time to get used to any change. Colic, cough or other illnesses can also disturb a baby’s sleep routine. The key is to be persistent, relax and soon you will develop a healthy sleeper who will allow you some zzzs too. Do you have any questions regarding how to make baby sleep? Please share in the Comment box below.